Sharad Dabra did his Bachelor of Engineering (B.E.) in Electrical, Electronics and Communications Engineering from Chitkara University. He is also a certified Business Analyst, Engineering Trainee in Telecom Engineering from Aspiring Minds. During his years in engineering, Sharad found felta spark of creativity inside him that was brewing to be explored more. As he started exploring the world of sketching, he realized that there were rarely any artist associations or teams. 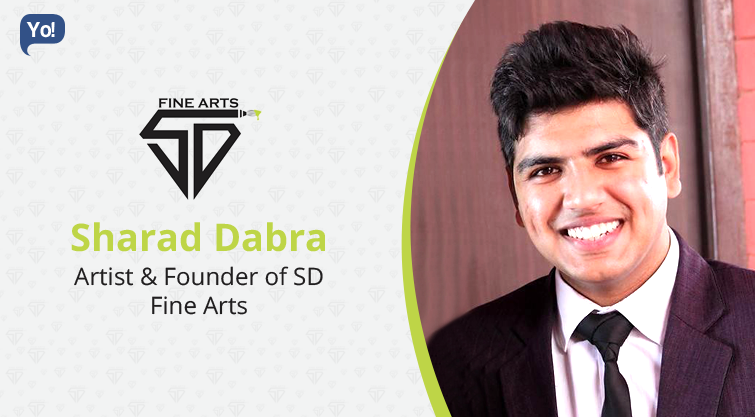 To solve this problem, Sharad came up with an idea and founded SD Fine Arts, which is an online mega art store is a team of fine artists. Customized Artworks : SD Fine Arts is an online portal where you can order fine hand sketched / handpainted portraits which will be crafted by a team of fine artists specializing in different art forms and the artwork will be delivered at your doorstep within a specific duration of time. with options of almost 6 different artforms including pencil sketches,charcoal sketches,oil paintings,wooden artworks,hand painted tees &coffee paintings. Artistic Interiors : With a vision to infuse creativity in one’s environment,we offer artistic interiors where we use unique range of artworks including metal,wood and wall arts to design space. During my B.E Years, i found this spark of creativity inside me that was brewing to be explored more.As I started exploring the world of sketching and started looking for websites and social links within the same field,I observed that there were too many freelance Artists but there was rarely any Artist associations or teams working on defined policies and neither there were any online services available offering customized artworks so, I was inspired to give my customers a new experience where they can order customized artworks for their family n friends plus they can get Artistic Interiors for their personal space by our Team of fine artists. Break the ice, ignite the fire inside you.It will lead the path to your Goals. The most challenging part was to choose a life of an artist over the life of an engineer. After completion of my B.E degree in Electronics and Communication, I started working for an MNC company, but soon realized it wasn’t my cup of tea. So the decision to leave a well-paid job for my passion was a tough decision. I always believed that we as an individual are here to make an impact and create a space of our own.So the thought of not following my passion left me wondering that I would leave a void or an empty space here if i don’t work for the dreams beliveing.So the decision to choose the Life of an Artist was firm and then all things fell into place and the rest is history. The Fog City (Hookah Lounge) : Lounge Interiors And with over 500 + customers for customized portraits . I read somewhere – If you ever think of Giving up,Remember why you started. This thought is like oxygen for living up to my dreams..
YouTube – It’s like a daily dose of learning for me.I can’t skip it. With the click of a button,you have the whole world with you helping you out with whatever you wish to know. Working late in the night and starting my day accordingly. This habit usually doesn’t go with the ideal policy but this works for me to a great extent. I guess I have made peace with my habits so ill let them be the way they are. Set Your Goals first..Without them,there’s no path. Stop criticizing limited resources.They are all you have to make the best you can. Nobody knows your potential.It’s a weapon you own,not the inability others think. To extend my team to 100+ artists. To bridge the gap between art and a common man. To Inspire people to follow their passion – this one is for self-satisfaction. Doesn’t really matter how differently i do it,The passion and vision will remain the same and that’s what matters. A Get Together with friends is probably the best getaway. Start Now…It’s never too late.